A noticeable absence on this blog has been talking about watches, because I have honestly only gotten into watches within the past two years. I have worn a watch daily since I was around fifteen years old, however, until recently, never really thought about them as much more than a functional tool. Well, I say that, but I have always had a clear preference for clean analogue styles. In all the years since I began wearing a watch on a daily basis, I think that I have owned a total of two digital watches (both Casio). There has always been something about the simplicity of an analogue watch that I enjoy, and the fact that for me it seems somehow less obtrusive and more elegant than a digital display. Additionally, although there have been more adventurous designs, such as some Swatch and Mr Jones watches, that I have loved the look of, the lack of numeral markers, or too busy a dial, have meant that I struggle to get an accurate reading, which rather defeats the purpose for me. 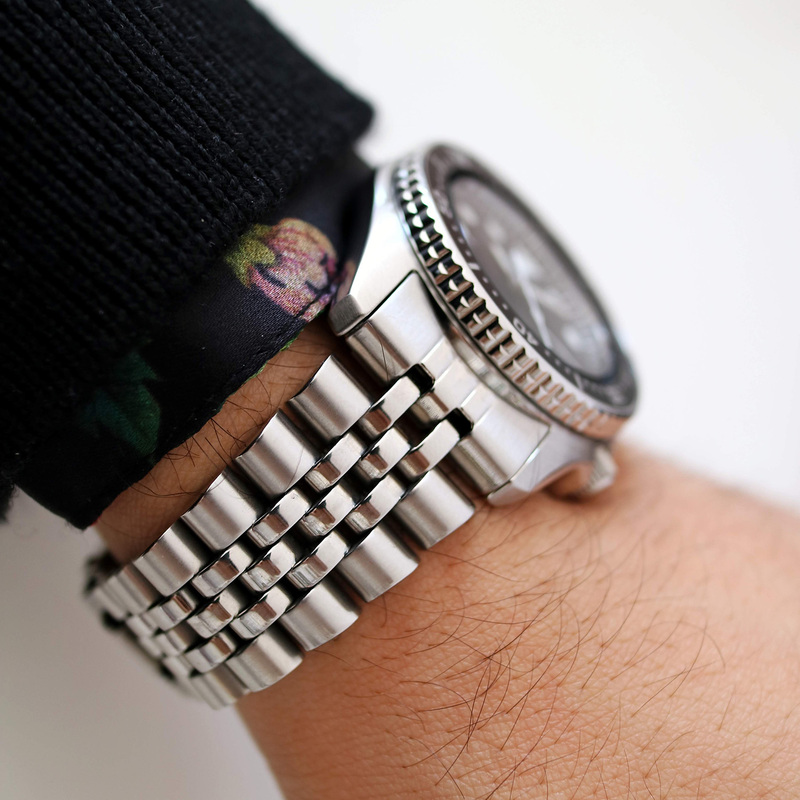 I realise that a lot of people consider their watches as nothing more than jewellery (after all, we all carry phones that tell the time far more accurately), but I like the idea of a beauty informed by such essential and simple function. There has always been something magical about telling the time for me, which is difficult to describe without sounding a little bit insane. But sod that, I will try anyway. Here I have a tool on my wrist which measures time - one the most important concepts and metrics we have to identify, situate and consider our lived experiences, sense of identity and relationship with others and the world around us. Three moving hands and a dozen numbers, and somehow I can use those to gain an understanding of when I am, when I have been, and when I am going to be. There is something truly beautiful in that. An hour is an hour, but we have all experienced an hour that seemed like it would never end, and an hour that passed by so fast we wished we could have another four or five. Apparently time does actually move slower for children and faster for the elderly. It has to do with the way that the brain processes novel experiences. While you are learning new things, your brain apparently perceives time as slower, versus speeding it up when you are in autopilot mode. Consider commuting to a new job for the first time - that first half hour journey seems to take forever, but within a month it seems to go by in a blink of the eye (unless of course there is something out of the ordinary like a cancelled train). My parents were kind enough to offer me buy me a watch for my birthday at the start of last year. Having researched for a few months previously to find something that felt right for me, I ended up choosing the Seiko SKX013 (the baby brother of the venerable SKX007). It is the first automatic watch I have ever owned, and having dived deep into the "watch world", I was fascinated by the beauty of all these different mechanical movements and complications, and so wanted a piece of that rich history. 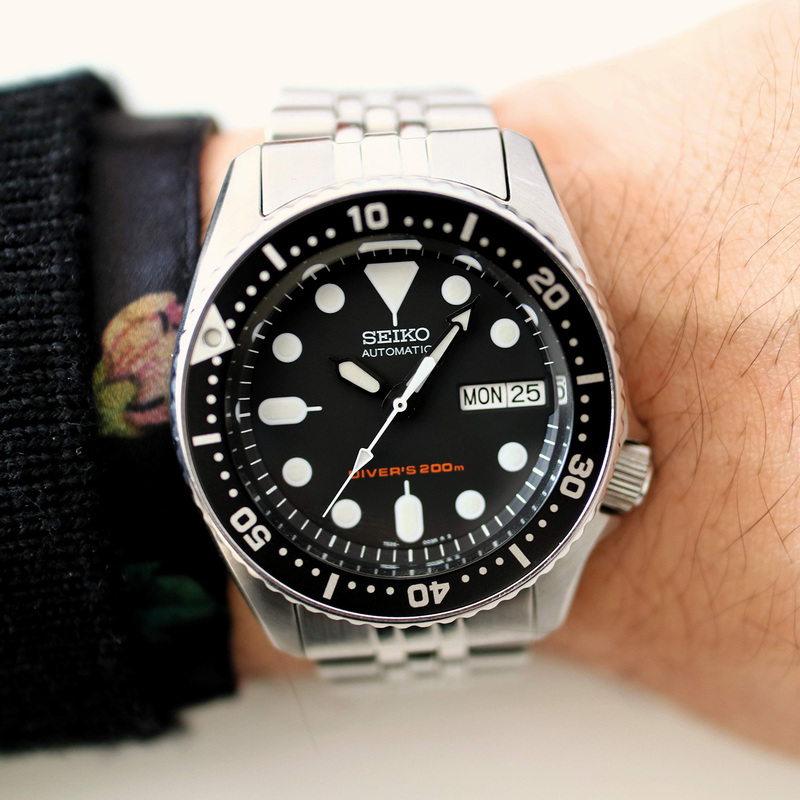 I am still a total novice when it comes to watches, but the SKX series seems to be where many collectors start, because they are just so well designed and functional. There is a wealth of information about watches online (a bit too much snobbish stuff, but I guess that is the same with fashion at large), and it really was that feeling of finding a new passion. I have never really thought of watches having character before, but I really like the character of this watch. It was the first time I have put on a watch and rather than seeing it purely as a functional tool, I saw it is as a beautiful object. I have owned and worn the watch for over a year now (and added a second watch to my collection for my birthday earlier this year), and it still makes me smile. Despite the fact that I have never learnt how to swim, I love the style of dive watches. I suppose it is because they value legibility so highly, and tend to have a bit of a chunkier style that makes them easy to operate (...the more I think about it, am I just a grandpa when it comes to watches?). The SKX has a dial that is really easy to read, with large amounts of Seiko's proprietary lume, which is surprisingly bright and will last for hours. I chose the SKX013 over its older brother, the SKX007, because I have super small wrists. Although given the compact lug-to-lug measurement of both, most people can probably get away with wearing either. Apart from the size difference the only noticeable visual difference is that the second hand has an arrowhead lume pip halfway down the stalk. The SKX007 has the second hand lume on the counterbalance. That has never made all that much sense to me, because in the dark you are essentially looking at it backwards, but I suppose having a ball of lume sweeping around the indices might make it a touch confusing to read in lower light. For those of you who like a little bit colour, you can get a Pepsi bezel version, the SKX009, which is otherwise identical to the SKX007. Speaking of the bezel - a rotating dive time bezel is something I never knew I wanted until I had one. I literally use it multiple times per day, which I really did not expect, but having the bezel right there makes it so easy. I think that it is the immediacy of it that makes me time things so much more readily. I mostly use it when cooking, because you can roughly time things on the fly. I find that with digital watches I never used the stopwatch feature, because you have to press buttons to get into another screen, but then have to press again to get back to the actual time. I do not like extra steps, preferring to see the time and the timer in one go, which is also why I do not set timers on my phone (especially not when cooking, because I prefer not to touch my phone then). 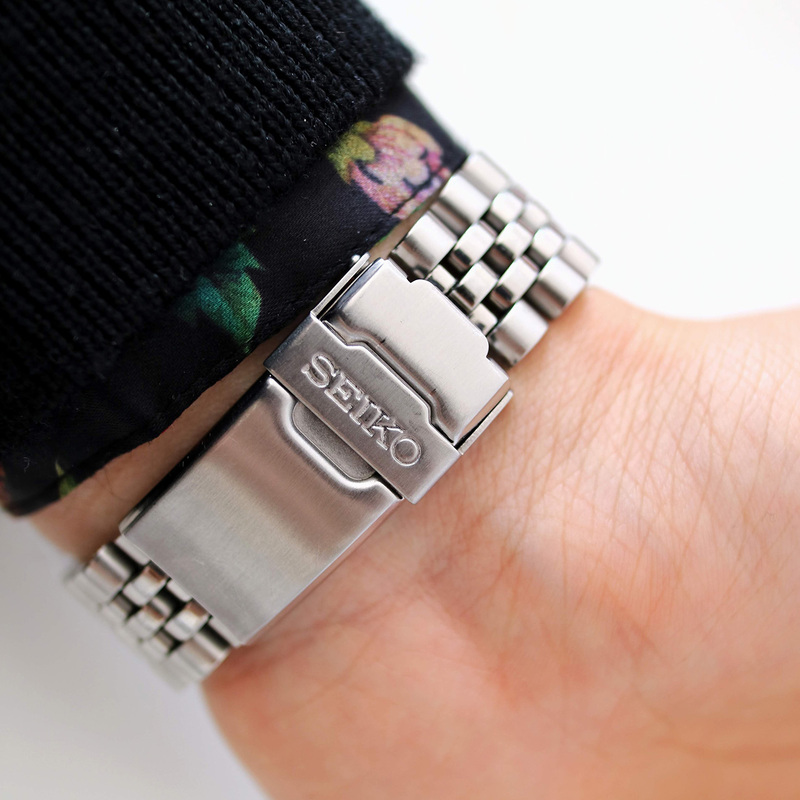 With a dive bezel you can set your time in one twist, and see at a glance how much time has passed. I can most certainly understand why chefs seem to love dive watches (aside from the rugged nature of them), because that ability to time things so easily really is lovely. The bracelet is apparently not all that popular, because it is not rigid, but I think that its flexibility makes it all the more comfortable to wear. I actually wear mine a little loose, because I do not like anything too constrictive, and find that it wears nicely with no pinching or tugging of arm hairs. I tried putting it on a Nato strap, but did not particularly like the top heavy feeling of that. But getting back to the comfort, the shape of the case is nice and compact, so it hugs the wrist, and I like the crown being shifted down to the four o'clock position, preventing it from digging uncomfortably into the back of your hand. It is a screw down crown, with the first position allowing you to change the day and date, while the second position is for the time. The movement in my watch runs at about -7 seconds per day, which is well within the stated tolerance, and suits me fine as I tend to set my watch a few minutes fast. Apparently you can strike lucky with the 7s26 and find ones that run within +/- 3 seconds, which is pretty amazing given the price, and not to mention the fact that they seem to run well for years between servicing. In general there is something quite nice about having an automatic movement - it feels like there is beating heart in the watch, as opposed to the comparative sterility of a quartz movement and cell battery. A quick shake of the watch from side to side and it starts ticking away nicely (well, sweeping, it is an automatic after all). Overall, the nicest watch I have ever owned. It appears to have quite the cult following online, and I can most certainly see why. "God Is Black Part 1"
I love designers who are story tellers, because in a way I think it is one of the purest aims of fashion - simply sharing a story. 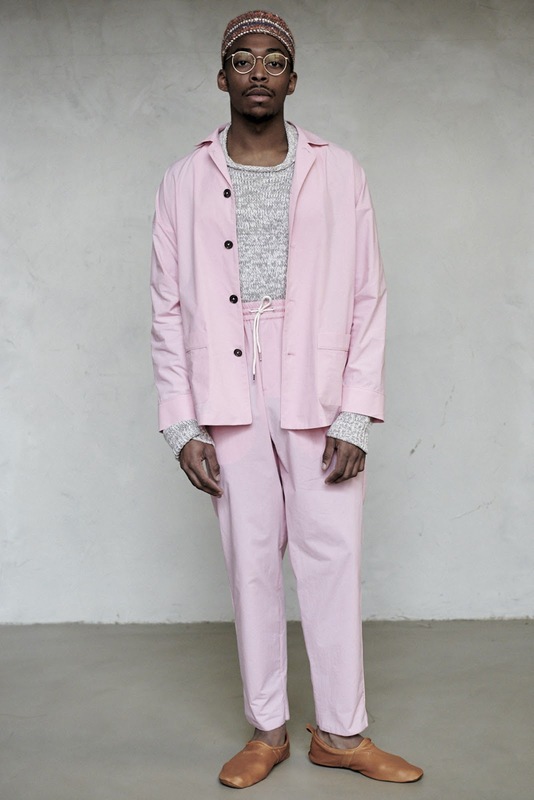 Umit Benan is one of those designers who shows each and every season his incredible ability to share stories, creating colourful fictions to immerse yourself in. And yet those fictions still manage to translate into wearable pieces that you can comfortably incorporate into your wardrobe. 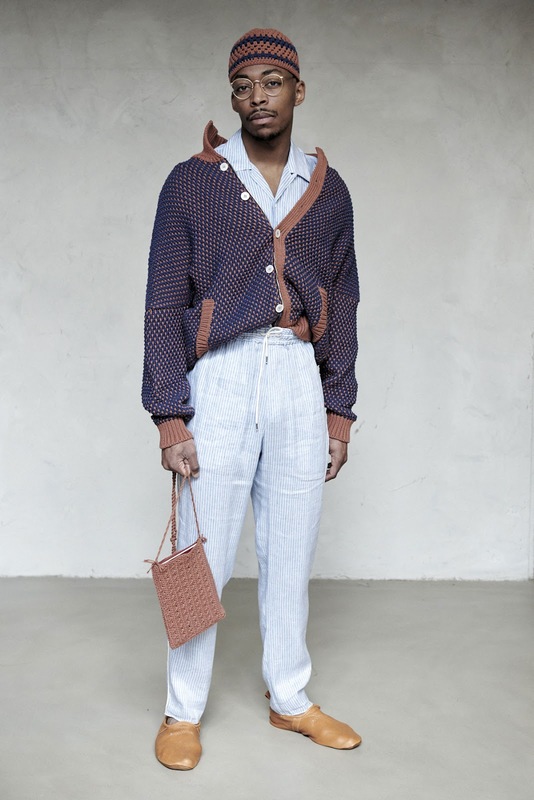 The starting point for his Spring/Summer 2019 collection, God Is Black Part One (Part Two debuted earlier this month in Barcelona), were takkes (otherwise known as topis or kufis) hand-knitted by his mother, that took him back to living in the Bronx as a young child. He said he remembered seeing African-American Muslims leaving the mosque, and thinking how stylish they were. 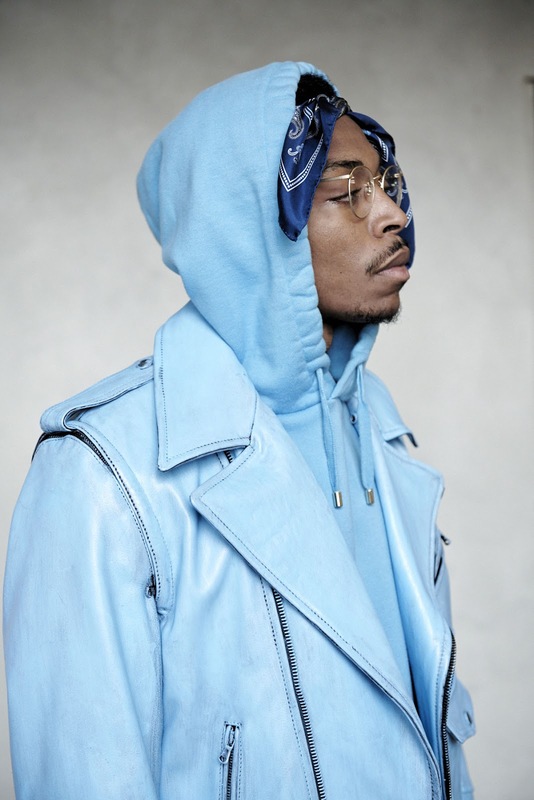 And so for this collection he explored the ideas of religion and racial identity, looking towards an array of African-Americans including Malcolm X, Martin Luther King Jr., and, most obviously from the styling of the collection, Tupac Shakur. If you are wondering why you may have not seen much of Umit before this collection, it is because he actually took time away from designing. 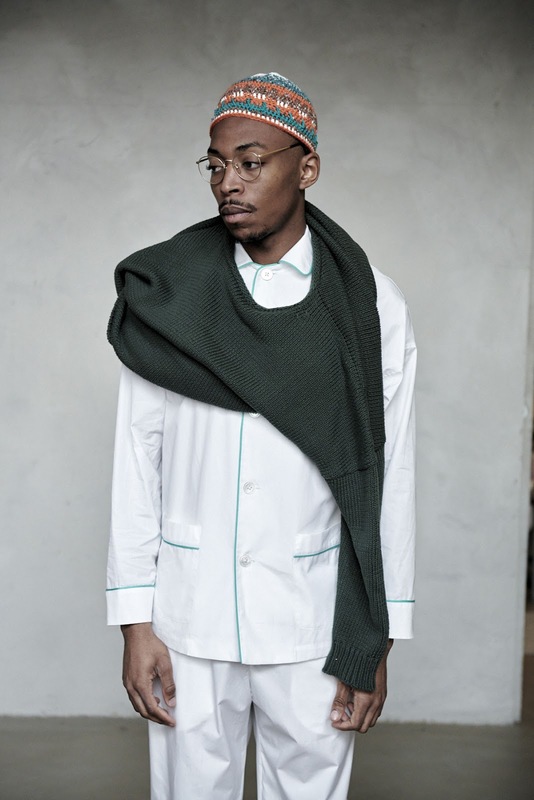 During this hiatus he underwent therapy and says that process allowed him to reconnect with his Muslim identity and belief in God, a journey which led him towards creating this collection. The result is a collection that resonates with me on a personal level and that reminded me of just how meaningful Umit's work is for me. There are multiple threads in this collection that hit home for me, and a lot of it is admittedly not even intentional on his part. Instead, as with most forms of art, it is what I connect to within the collection, and how I interpret those ideas. And that is one of the reasons I am always so impressed with Umit's work, in that he creates these highly stylized fictions each season, which you think would constrain your interpretation, but for me there is always something there that I see which gets me hooked and then flowers in my mind. 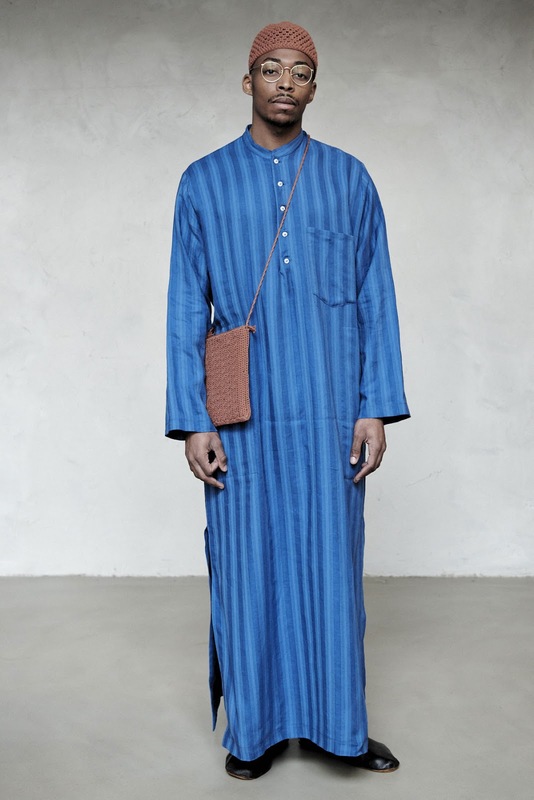 I am fascinated by this collection primarily because of the very simple question - what does a Muslim look like? As regular readers will know, I do not discuss religion here, mostly because I subscribe to the Ron Swanson belief that I am a practising none of your ****** business. However, I am a Muslim, and what with my name I am sure that some can work out which sect. Given the dominant narrative surrounding Islam in the media today, I think the idea of dress and identity where being Muslim "in the West" is concerned is a truly intriguing topic. The most often spoken about article of dress when Islam is mentioned is the "hijab", although in fact people are usually discussing the niqab, which is the face covering worn by a small minority of women. Hijab is actually an umbrella term, referring not only to dress codes, but also behaviour, which applies to both men and women. However in colloquial discussion hijab usually refers to the simple headscarf for women that covers their hair. People seem to throw the term burka around a lot, but that is actually a full on long loose robe worn by women, whereas the niqab is the aforementioned face covering. 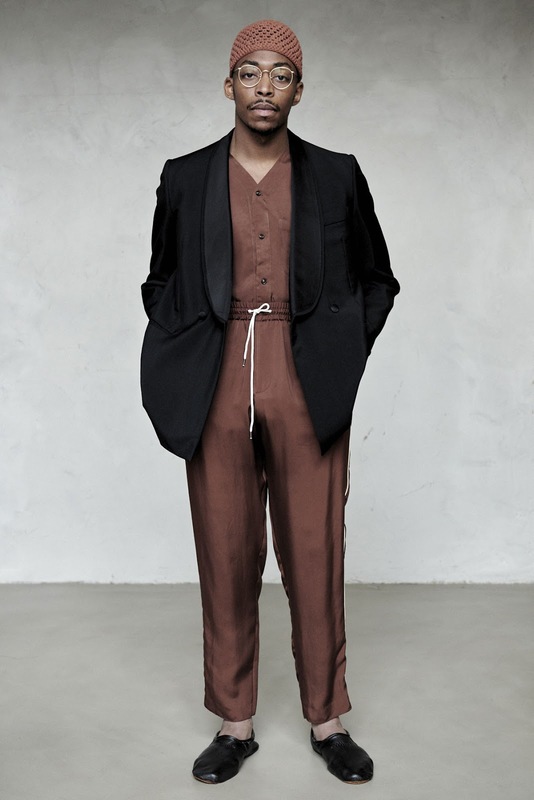 Umit took for his inspiration the idea of the Black Muslim, but this collection is clearly not a take on the stereotypical attire one might associate with a member of the Nation, which I assume most Americans would think of when given the combination of Black and Muslim. Rather it fits nicely into a wider discussion of Muslim representation as a whole, and what it means to be a Muslim today. An interesting aside at this point is that the Hispanic community is actually the fastest growing group of Muslim converts in America today. As much as the media like to portray a singular conservative image of Islam, Islamic history is actually one of a cultural melting pot, where one can find a wealth of diversity when it comes to architecture, artistic styles and indeed dress history. 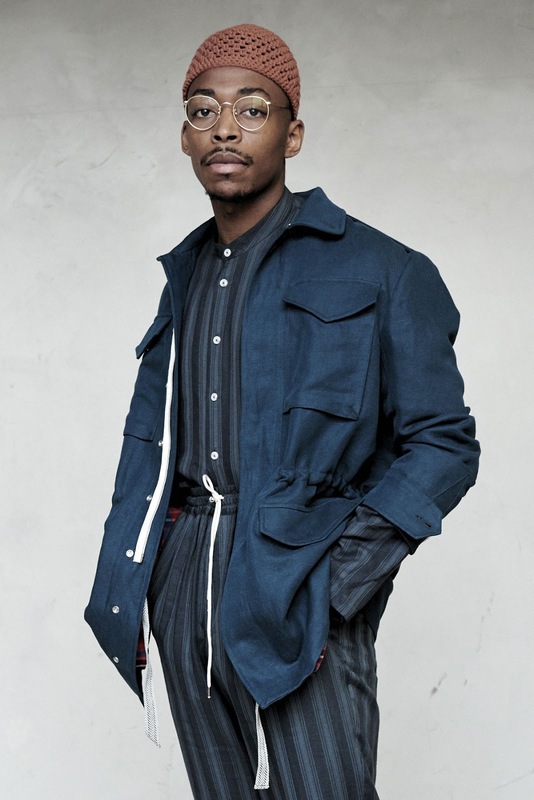 Here we see everything from a hoodie and bandana, to more formal tailoring, but all tied in together seamlessly. Remove the topis, and you would likely not necessarily even think the word Muslim, which I think is the power of this collection. What does a Muslim look like? Well, like everybody else. But even so, Umit's mix of sportswear alongside kaftans seemed wholly organic for me. You see, I have my own childhood memories of topis, having attended Saturday school until my late teens. Even now I am fascinated by what people wear to the mosque, and how this has changed over the years - the most notable difference is actually just in the shift from working class to middle class, and the pecuniary freedom that comes with it. Whereas people used to wear discount high street brands, you now see far more higher end store brands and even a number of designer pieces. And where more traditional clothing is concerned, you used to see shalwar kameez that were ill-fitting and imported on the cheap, but now you are much more likely to see tailored pieces bought while travelling "back home". My local mosque was home to first and second generation immigrants as I was growing up, although now it has a far more diverse attendance. 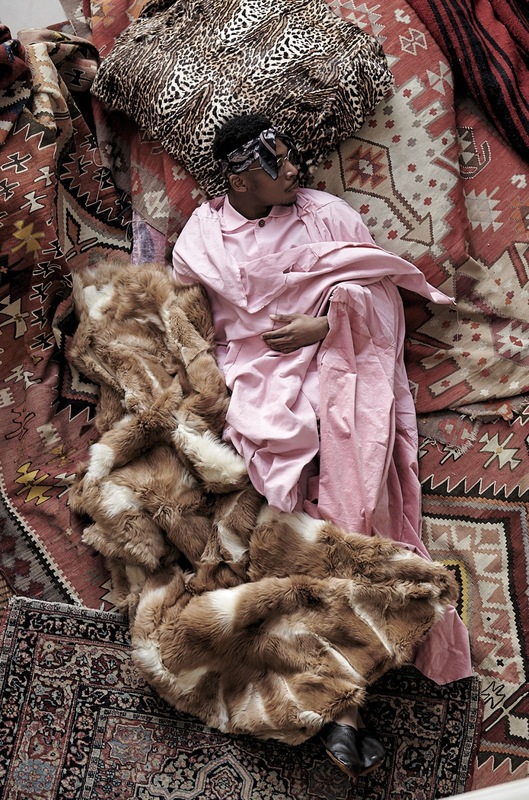 For those of us whose parents had come to London from abroad before we were born (primarily South Asia and East Africa in my local community), we grew up with a stark clash of cultures, and you would see numerous attempts to resolve that nebulous sense of identity through clothing. Culture and religion are two very different things, and yet the overlap in this instance is difficult to divide neatly. 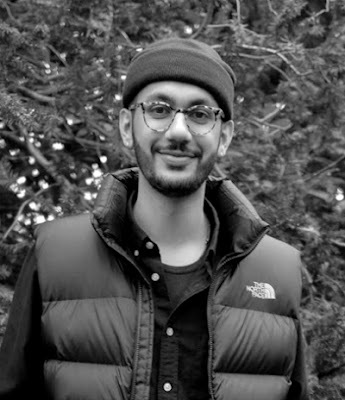 Dress was the site for negotiating identity and exploring what it meant to be British, while also being South Asian (or East African, or Iraqi, or Syrian, etc.) and Muslim. 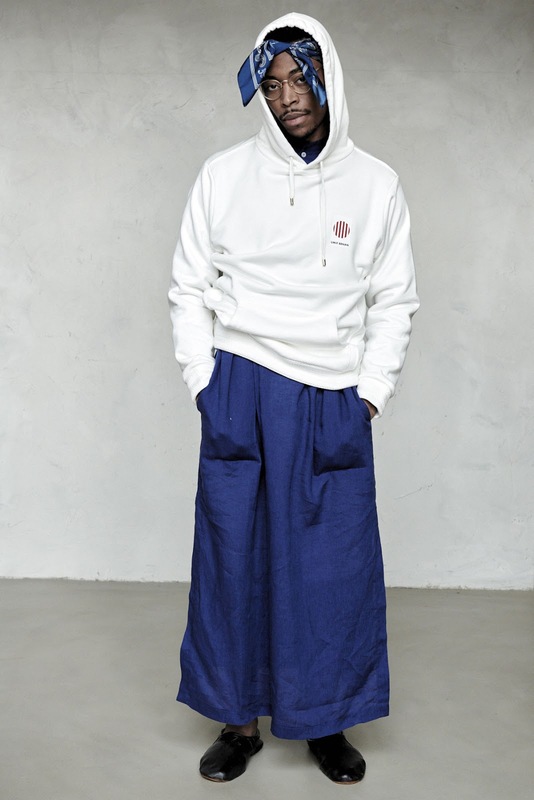 It was, and still is, common to see a dishdasha worn with the latest Air Max sneakers, or a shalwar kameez with the pyjama swapped out for sweatpants and some Air Force Ones. My mother actually came to the UK as a child and went to school here, and she remembers wearing flared jeans with kurtas as a teenager. 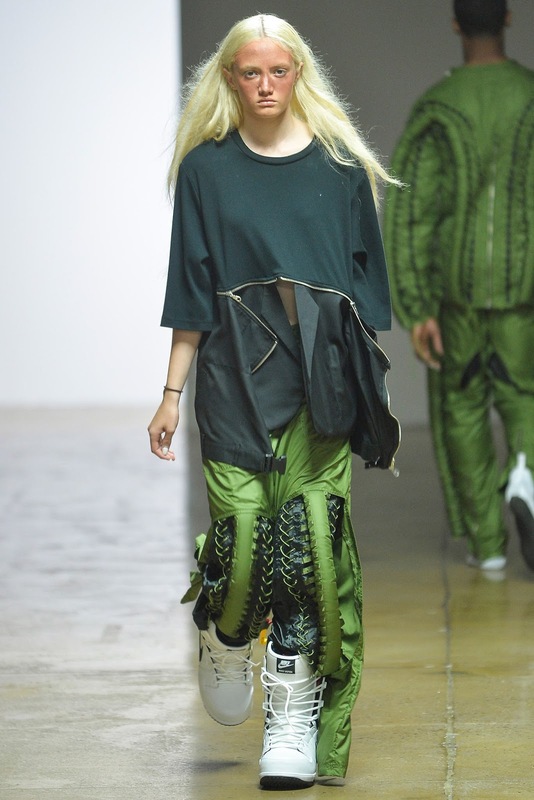 Combining styles and combining garments was a way of fitting into and attempting to resolve two parts of our identities, that to the outside world may have seemed entirely incompatible. But that is the beauty of dress, in that you are able to create something that reflects who you feel you are, and thus allowing you to celebrate the beauty in that. I have always thought of it as getting the best of both worlds. Then again, I have been asked on a number of occasions when simply wearing a Yohji blazer and trousers with the hems rolled whether I was dressed that way "for religious reasons" (the answer is yes, you should accept our Lord and Saviour Yohji Yamamoto into your life, and I am happy to take cash or PayPal donations directly for the Church). I am a brown man with a beard, and here in the UK that generally seems to mean Muslim for most observers. I remember being stopped and searched by police on a number of occasions at the train station when I started university. I was always told that it was a "random" search. They would take me into a side room where, lo and behold, the only other people being searched were also brown men with beards. No matter that one person could be in a suit, another in sweats, and someone else in their work uniform. And obviously it goes without saying that not everyone there was even Muslim. But once I remember catching someone's eye as we were both being searched, and we gave each other a sad smile and a nod. Even as a teenager being brown was enough to get Islamaphobic abuse hurtled your way. I remember shortly after the Iraq war began being pelted with hamburgers and a milkshake while in a shopping center. I was repeatedly called a "dirty Muslim" and told to go home (in actuality they had Northern accents, I have a London accent, and so clearly they were the ones who could do with going home). But no matter what happens, how I might be negatively judged for my skin colour and appearance (to say nothing of my religion), I am proud of who I am. I see the meeting and mixing of these different backgrounds and identities as an opportunity to find the best in each world and use that to celebrate what makes each and every one of us individual. And so, while I obviously cannot relate to the Black identity or experience presented in this collection, the pride and celebration of racial identity in itself is something that most certainly resonated with me. 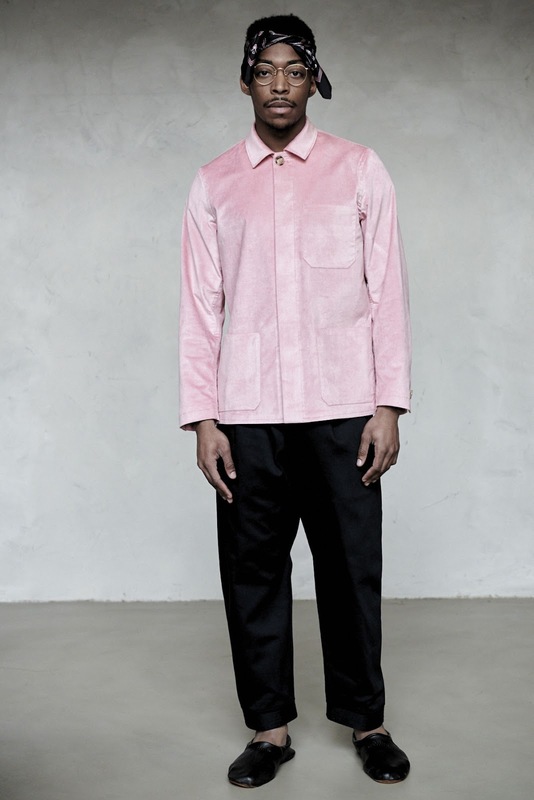 Umit celebrated race and religion, I mean just look at the title of the collection, in a way that really hit home for me. 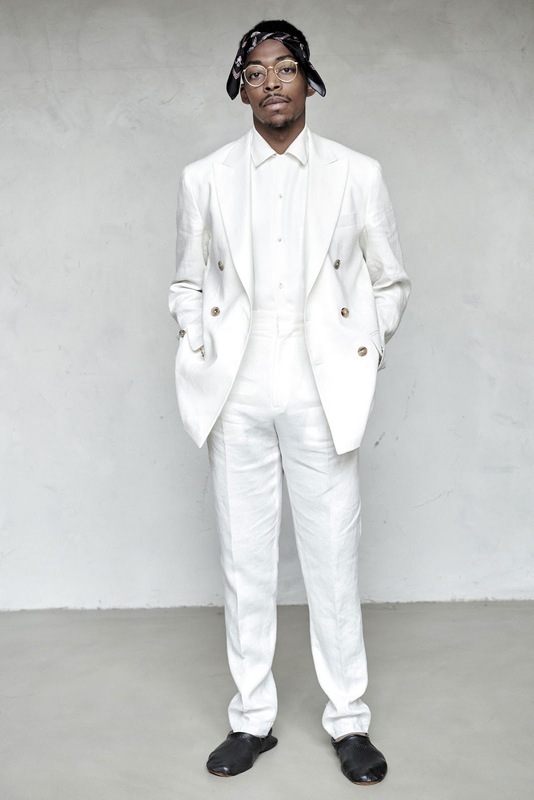 I enjoyed how luxurious the clothes were, what with a workwear jacket made of velvet, or crisp white pyjamas presented alongside white tailoring, and the fact that there was such an effortless elegance and beauty to the garments. The hand-knitted topis really were the icing on the cake, and made me instantly smile. Here being Muslim and being Black are truly things to be celebrated, and I really do think we need more of that these days. The sleeve pocket is unfortunately a touch too narrow for my usual notebook. I have been the process of clearing my wardrobe out, but I still managed to pick a few things up in the end of the year sales. I thought it might be interesting to write about my impressions of, and experiences with, each piece thus far. I wanted to pick up a lightly padded jacket for the in-between seasons, because I sold my previous jacket. 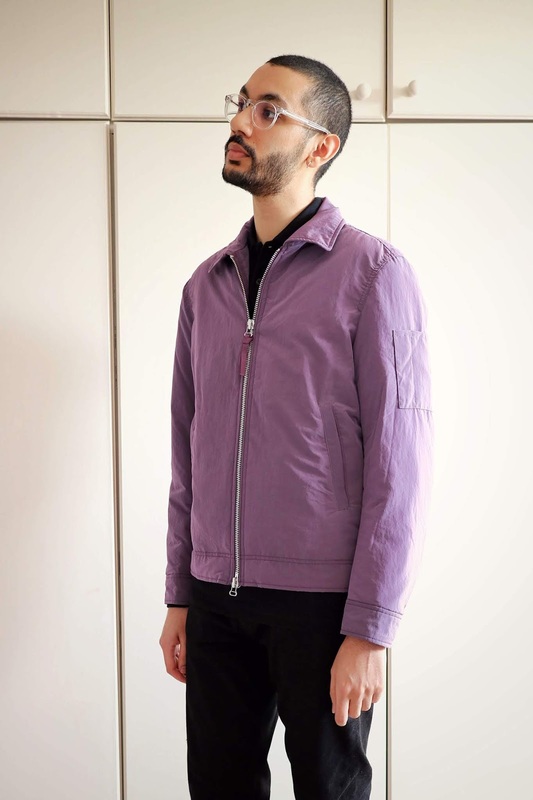 I actually had my eye on this jacket for around a year, because it had been, and apparently still is, languishing in the Arket sale section for several months. Now when a garment has been in multiple seasonal sales and is still not sold out, I do get curious as to whether it is actually just hot garbage. But I thought that it was worth trying out, because I could simply return it without any issue if it was indeed basura. And I am most certainly glad that I did, because I really like this jacket. The reason that I had not pulled the trigger on it sooner, was because of the colour - I kept going back and forth between thinking it was a beautiful colour, but then thinking that it was too much colour for me to wear. Once again, it was that "insecurity black" way of thinking, and so I knew that I had to try it. The matte nylon plays with the light quite nicely, giving this piece an almost metallic sheen. In fact it almost reminds me of a 3M reflective material, without actually being properly reflective. 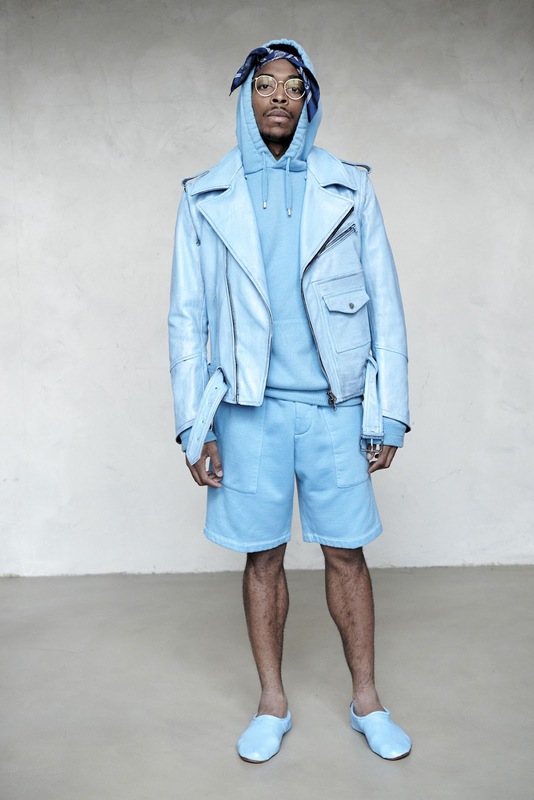 And it might just be me, but I get a bit of a Haider Ackermann vibe from the colour, if not the garment itself. What I will be interested to see is how the colour changes when the jacket gets a little wet, because I can imagine the fabric getting darker as rain hits it, giving the colour an even greater depth. I like the way that the material sounds in movement, because while there is a lot of rustling as you would expect from nylon, it is quite smooth rather than overly obtrusive. The Thermore lining makes it nice for cooler days, although with the weather here in London right now being so cold, I am waiting for milder weather before I break this out properly. The padding is lightweight and thin, as you would expect from Thermore, and given past experience with the material, I know how insulating it can be. I was pleasantly surprised with the fit, simply because I have tried on quite a few Arket pieces and found the cuts inconsistent. I went true to size with a 46 (Small), and was happy with the fit - it feels snug, but you could still rock a hoodie or slightly thicker jumper underneath without too much issue. The sleeves and waist have two button adjustment, so you can get a tighter cuff and waist accordingly, which is always nice. I thought the notebook and pen pocket on the sleeve was an interesting touch, especially against a folded collar, rather than the elastic ribbing of a flight jacket where you would usually see this detail. 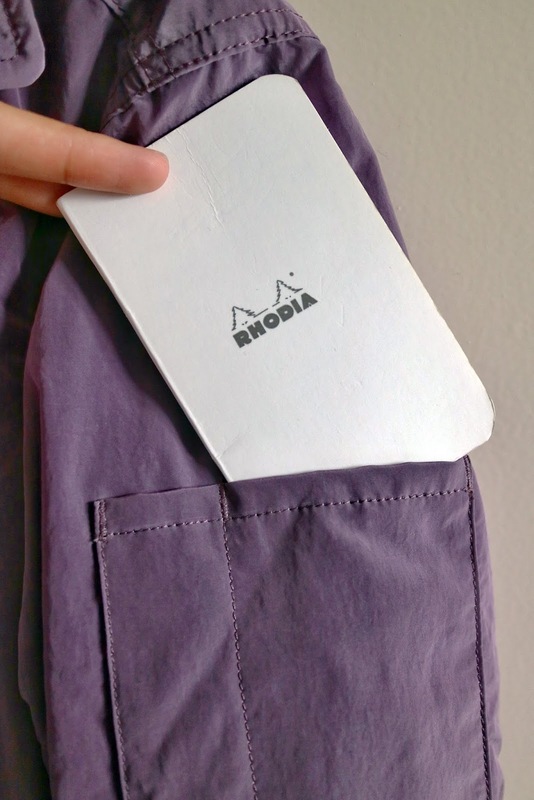 I do actually carry a pen and notebook in my jacket or coat at all times, and while the sleeve pocket is a touch too narrow for my everyday pocket notebook (a Rhodia mini 75mm x 120 mm), I was not really expecting it to fit anyway. There are two internal pockets, along with the two waist pockets, so storage is not an issue. Overall I think it is a really nice piece, especially at the sale price. 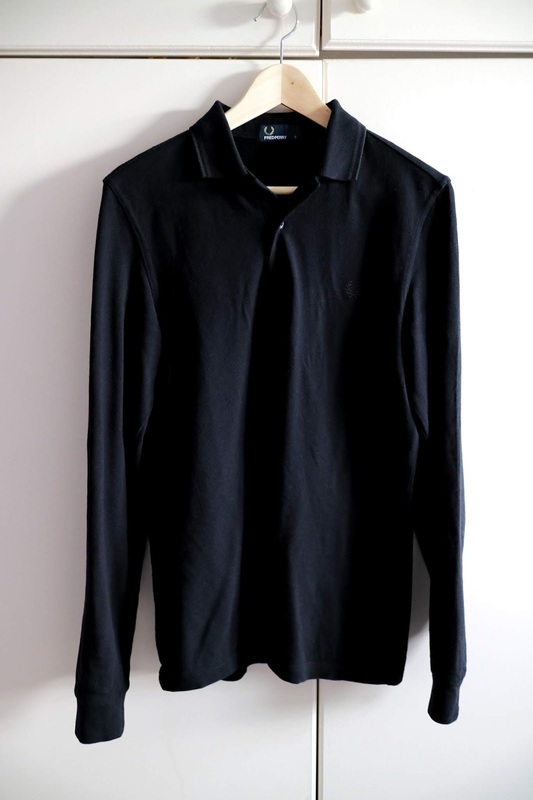 I have had a long sleeve polo shirt on my shopping list for about three years now, but kept putting it off after trying out some generic store versions and being disappointed with the fit and quality. I do not wear short sleeve polo shirts, because they remind me too much of a PE teacher, which is not really my style (then again fleece reminds of Geography teachers, and I wear that, so I am not against all teacher-inspired swag). The right polo shirt really can be a truly versatile piece, and given the smaller size of my wardrobe, I do prefer pieces that can pull double duty. What surprised me is that my father saw me wearing this and remarked on how smart it looked. He never usually compliments my clothing, so clearly this has dad certification too, which is not to be sniffed at. Once again the price on this piece was really good, and so I thought that I might as well pull the trigger and see. I went true to size because I wanted to get a proper idea of the cut and fit of Fred Perry, not having really bought much from them before. I usually struggle with sleeve lengths, because I am narrow but tall, however these fit spot on. I like the cuffs because they hold their elasticity, allowing them to be pulled up and down frequently throughout the day without them bagging out. Personally I wish they had a split side seam, just for a bit of room around the waist when pulling it over a belt (I wear my trousers pretty high up), but the fit is fine overall. 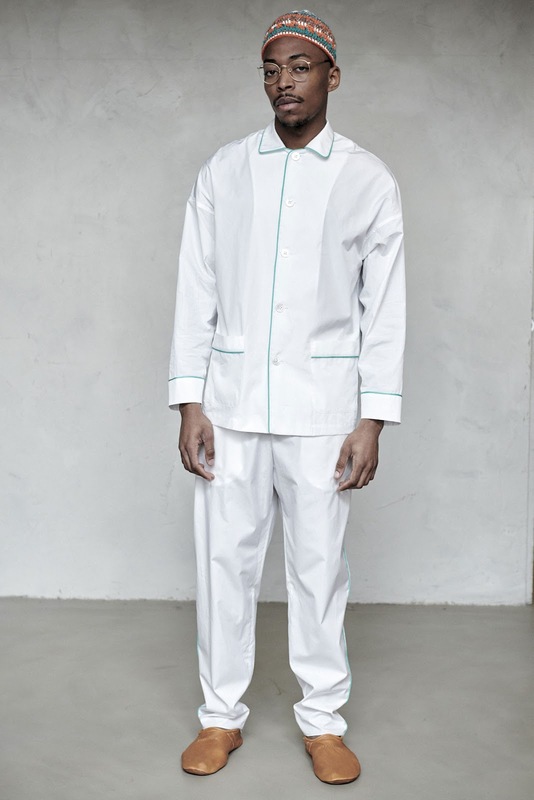 I like the pique fabric, which has a surprisingly smooth and soft feel on the interior side that touches the skin, and the collar has a nice shape to it. I went for the all black, because I do not particularly like obvious logos, and thus far the colour has held up well with two washes. A Crohn's flare means inflammation, and for me that means grating knee pain on top of everything else. I have been on the hunt for some comfortably cushioned shoes that I can wear on bad knee days for a while now, and finally settled on these from Hoka One One (apparently pronounced "Oh-nay oh-nay") that I picked up for a good sale price. Hoka are known for their more extremely cushioned running shoes, to the point that some of them look like platform shoes to me, but these slip ons are relatively sleek and super lightweight. The midsole is made from a foam and rubber material by Hoka called RMAT, which provides a smooth ride with high-rebound. I have been wearing these for around three weeks now, for everyday walking rather than running (although hopefully within in a few months I can run! ), and have to say that they have been an absolute delight on my feet and knees. I find the soles cushioned and responsive, with none of the mushiness I experienced in the other cushioned shoes that I tried. I appreciate the fact that the cushioning is also not so much that I lose ground feel entirely, which actually helps me feel a little more stable on my feet. They have a good bounce to them, and feel great even after long walks and a full day on your feet. They provide a neutral ride, with a heel-to-toe drop of 5mm - apparently other people have had issue with it being far more than that, but I would say there is a noticeable difference to other shoes I tried with an advertised 10mm drop. I most certainly prefer this sole to the React cushioning by Nike (I tried the Epic Reacts and was not sold) for everyday wear, just because it does not feel as unsteady to me. I have found the wearing shoes that do not provide sufficient stability actually help to gradually increase my anxiety over the course of the day. Please do bear in mind that I am using these for walking thus far, and not running, so obviously your mileage will vary. I went true to size with these (UK 10/US 11). 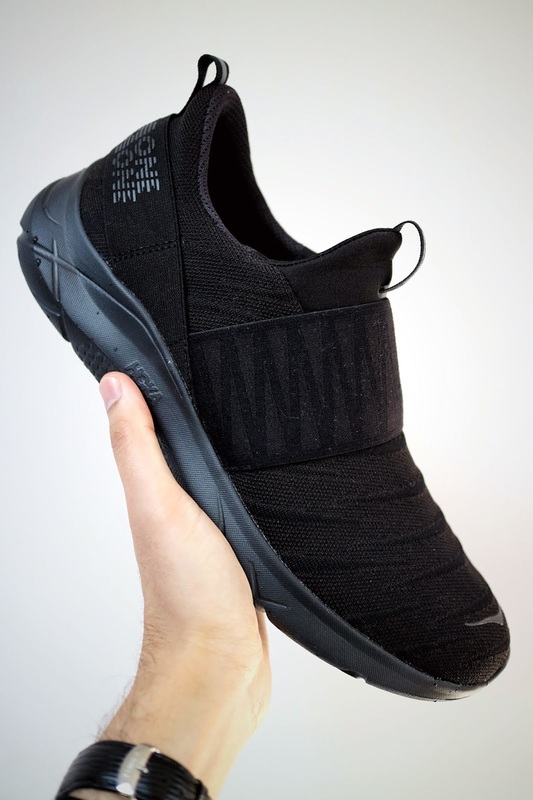 The fit of the shoe is narrow, but given how narrow my feet are, I actually find them one of the better fitting shoes I actually own, which I was not expecting from a slip on. I would say people with a wider midfoot might not be too comfortable. But otherwise there is a decent amount of room in the toes, and generally slipping my feet in and out of these is easy, especially with the pull tabs. I was also surprised by how well locked down my heel felt, and have not experienced any slipping or rubbing when walking. 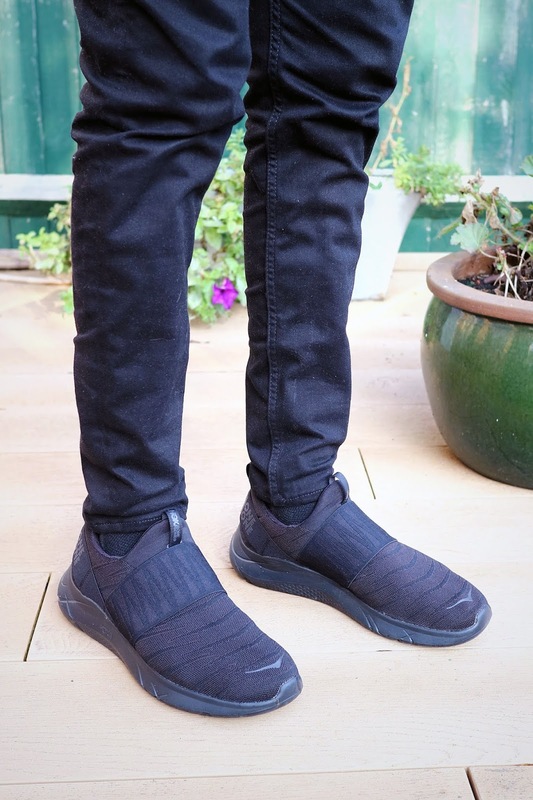 The stretchy upper is breathable without making my feet feel particularly cold in the current Winter weather, and I assume once I switch from thicker socks to thinner socks that these will be equally comfortable as the weather warms up. Thus far these shoes have done nothing but impress me, and my knees are certainly thankful.